Submit entry along with completed entry form to the Wellington office. The National PTA Reflections Program encourages students of all ages and abilities to explore and be involved in the arts in an educational way. 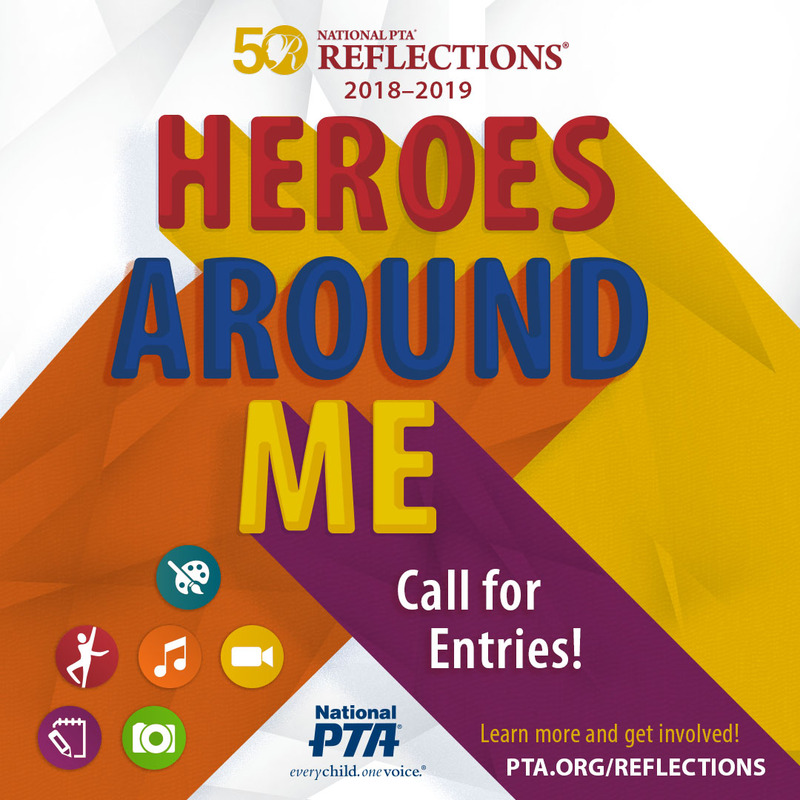 Through the program, Wellington PTA and PTAs across the country urge students to reflect on the theme for 2018-19 (Heroes Around Me) and then create and submit original works of art in the medium of their choice. The act of creating movement. Consider the following styles and ensembles to portray your original choreography: ballet, contemporary, ethnic and folk, freestyle, hip hop, jazz, street dance and tap. The process of making a film. Consider the following styles to portray your original work of fiction or nonfiction: animation, narrative, documentary, experimental or multimedia. The art of writing. Consider the following literary styles to portray your original work of fiction or nonfiction: poetry, prose, drama (screen play and play script), reflective essay, narrative or short story. The process of creating a new piece of music. Consider the following musical styles and instruments to portray your original composition: A cappella, blues, choral, country, electronic, hip hop, jazz, world music, orchestral, pop, R&B, religious, rock, symphonic/concert band and traditional. The process of creating an image. Color or Black & White, included techniques: photogram, negative sandwich and multiple exposure. Art forms that are visual in nature. 2D Visual Arts: Collages, photographic collages (multiple photos cut/pasted), computer generated images, drawing, painting and printmaking. 3D Visual Arts: Architectural carpentry, ceramics, crafts, design, dioramas, fiber work, jewelry, kites, metal etching/punch work, mobiles, sculpture and wind chimes. Participation is organized by student grade levels. Student works are critiqued against others in the same grade division. This allows recognition and judging of artworks by appropriate developmental age and skill levels.